Production: Films de la Pléïade; black and white, 35mm, in Dyaliscope; running time: 80 minutes, English versions variously noted at 84 and 92 minutes. Released 22 August 1960, Paris. Filmed 1 December 1959–15 January 1960, additional shooting in March 1960. Filmed in Paris at a café and at Rue Mussard, also in Levallois and Le Sappey, France. Producer: Pierre Braunberger; screenplay: François Truffaut and Marcel Moussy, from the novel Down There by David Goodis; photography: Raoul Coutard; editors: Claudine Bouché and Cécile Decugis; sound: Jacques Gallois; art director: Jacques Mely; music: Georges Delerue. Cast: Charles Aznavour ( Charlie Kohler/Edouard Saroyan ); Marie Dubois ( Lèna ); Nicole Berger ( Michèle Mercier ); Serge Devri ( Plyne ); Claude Mansard ( Momo ); Richard Kanayan ( Fido ); Albert Rémy ( Chico ); Jacques Aslanian ( Richard ); Daniel Boulanger ( Ernest ); Claude Heymann ( Lars Schmeel ); Alex Joffé ( Passerby who helps Chico ); Bobby Lapointe ( Singer in café ); Catherine Lutz ( Mammy ). Truffaut, François, and Marcel Moussy, Tirez sur le pianiste , in Avant-Scène du Cinéma (Paris), July-August 1987. Armes, Roy, French Cinema Since 1946: The Personal Style , New York, 1966. Petrie, Graham, The Cinema of François Truffaut , Cranbury, New Jersey, 1970. Crisp, C. G., and Michael Walker, François Truffaut , New York, 1971. Braudy, Leo, editor, Focus on Shoot the Piano Player , Englewood Cliffs, New Jersey, 1972. Crisp, C. G., François Truffaut , London, 1972. Fanne, Dominique, L'Univers de François Truffaut , Paris, 1972. Allen, Don, Truffaut , London, 1973; as Finally Truffaut , 1985. Collet, Jean, Le Cinéma de François Truffaut , Paris, 1977. Insdorf, Annette, François Truffaut , Boston, 1978. Walz, Eugene P., François Truffaut: A Guide to References and Resources , Boston, 1982. Winkler, Willi, Die Filme von François Truffaut , Munich, 1984. Bergala, Alain, and others, Le Roman de François Truffaut , Paris, 1985. Collet, Jean, François Truffaut , Paris, 1985. Truffaut, François, Truffaut par Truffaut , edited by Dominique Rabourdin, Paris, 1985. De Fornari, Oreste, I Filme di François Truffaut , Rome, 1986. Dalmais, Hervé, Truffaut , Paris, 1987. Brunette, Peter, editor, Shoot the Piano Player: François Truffaut , New Brunswick, New Jersey, 1993. Insdorf, Annette, François Truffaut , New York, 1995. Holmes, François Truffaut , New York, 1998. Toubiana, Serge, and Antoine De Baecque, Truffaut , New York, 1999. Jacob, Gilles, François Truffaut: Correspondence 1945–1984 , Lanham, 2000. Baby, Yvonne, in Le Monde (Paris), 24 November 1960. Kas, Pierre, in Cahiers du Cinéma (Paris), January 1961. Martin, Marcel, in Cinéma (Paris), January 1961. Durgnat, Raymond, in Films and Filming (London), February 1961. Torok, Jean-Paul, "The Point Sensible," in Positif (Paris), March 1961. Houston, Penelope, "Uncommitted Artist?," in Sight and Sound (London), Spring 1961. Rhode, Gabriel and Eric, "Cinema of Appearance," in Sight and Sound (London), Autumn 1961. Kauffmann, Stanley, in New Republic (New York), 9 July 1962. Crowther, Bosley, in New York Times , 24 July 1962. Sarris, Andrew, in Village Voice (New York), 26 July 1962. Cukier, Dan A., and Jo Gryn, "Entretien avec François Truffaut," in Script (Paris), April 1962. Kael, Pauline, in Film Culture (New York), Winter 1962–63. Collet, Jean, and others, "Entretien Avec François Truffaut," in Cahiers du Cinéma (Paris), December 1962. Shatnoff, Judith, "François Truffaut: The Anarchist Imagination," in Film Quarterly (Berkeley), Spring 1963. Klein, Michael, "The Literary Sophistication of François Truffaut," in Film Comment (New York), Summer 1965. "Hommage à Truffaut à Annency," in Cinéma (Paris), January 1967. Comolli, Jean-Louis, "Au Coeur des paradoxes," in Cahiers du Cinéma (Paris), May 1967. Comolli, Jean-Louis, and Jean Narboni, "Entretien avec François Truffaut," in Cahiers du Cinéma (Paris), May 1967. Wood, Robin, "Chabrol and Truffaut," in Movie (London), Winter 1969–70. Bordwell, David, "A Man Can Serve Two Masters," in Film Comment (New York), Spring 1971. Simsolo, Noël, in Image et Son (Paris), March 1972. Thiher, A., "The Existential Play in Truffaut's Early Films," in Literature/Film Quarterly (Salisbury, Maryland), Summer 1977. Dudley, Don, in Cinema Texas Program Notes (Austin), 2 March 1978. Chion, M., "Un Film meteore," in Cahiers du Cinéma (Paris), March 1982. Latil le Dantix, M., in Cinématographe (Paris), March 1982. Blanchet, C., " Tirez sur le pianiste : Le Second degré du cinéma," in Cinema (Paris), May 1982. Marias, M., in Casablanca (Madrid), February 1984. Gillain, A., "La scène de l'audition," in Avant-Scène du Cinéma (Paris), no. 362–363, July-August 1987. Guérif, François, "François Truffaut et la série noire," in Avant-Scène du Cinéma (Paris), no. 362–363, July-August 1987. Crowdus, Gary, in Cineaste (New York), vol. 18, no. 1, 1990. Davis, H.L., "Reminiscing About Shoot the Piano Player ," in Cineaste (New York), vol. 19, no. 4, 1993. Kehr, Dave, "A Poet of Darkness, Who Longs for the Light," in The New York Times , 16 May 1999. François Truffaut's astonishing success in his debut, The 400 Blows , was unpredictable, but that film does follow in the tradition of autobiographical first works by young and terribly sincere artists. As Truffaut himself recognized, the second work is the real test, and for his test he chose a subject and a style utterly opposed to that of 400 Blows . Shoot the Piano Player is distant from Truffaut's personal life, distant some would say from life in general; it is as much as possible a filmmaker's film. Drawn from a standard detective novel called Down There by David Goodis, the film played with the conventions of the genre and with the stylistic possibilities of the medium. Thought to be too recherché, it received no American distribution until after the success of Jules and Jim (1961), but since then it has become prized by many people as Truffaut's most inventive work. It was Truffaut's plan to inject life into contemporary French cinema first by emulating the American cinema (hence, the gangster genre) and then by gleefully upsetting the conventions and good taste that in his view had rigidified the movies in his country. He began with casting, purposefully giving the central role to the timid and introspective Charles Aznavour. 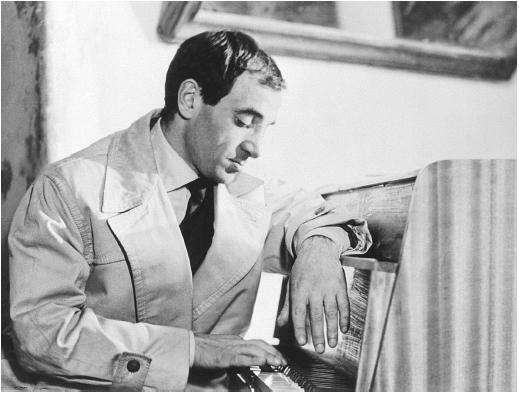 Aznavour, already a successful singer, was not without screen experience: Truffaut had admired him in Franju's Tête contre les murs . No one would have suspected that he could play Charlie Kohler, alias Edouard Saroyan, a concert pianist turned honky-tonk loser, especially when cast alongside typical tough guy characters. Truffaut exploited the contradictions by making the subject of timidity central to the film and treating it as it had never been treated in the movies before. His chief gangsters came right out of the cartoon strips. Their tight-lipped argot is interrupted by long disquisitions about female sexuality and the unforgettable throwaway anecdote about a steel-fabric necktie. Truffaut embedded countless jokes and citations within his tale. Lars Schmeel, the lecherous impresario, is named for Lars Schimdt, the man who took Ingrid Bergman away from Rossellini, one of Truffaut's friends and heroes. Chico, Charlie's older brother, is named after Chico Marx. But far more than placing disruptive elements within a conventional story, Truffaut went out of his way to find a new way to tell such a story, to tell in fact a new kind of story. In its first sequence Shoot the Piano Player announces the indirection of its method. Chico, chased down a dark street by an unseen car, runs into a lightpost and is knocked out. The first incongruity (crashing into the only bright object around) is replaced by a second as he is helped to his feet by a passerby. The chase is forgotten in a lengthy conversation about sexual fidelity and the joys of marriage. We will never see this "extra" again, but he has set the film on its way, interrupting its suspense with a tale about tenderness and love. The film as a whole proceeds in just this way: overly serious speeches (and even voice-overs) are cut short by ridiculous subactions (Clarisse tempting a client; the poor mug who owns the bar getting chummy with Charlie as he tries to choke him to death). Visually, as Roger Greenspun has noted, the film alternates blacks and whites like the keyboard, which is its central image. Gangsters are funny, the heroine tells dirty jokes, milk poured on the car obscures the vision of the driver, snow on the windshield is alternately black or white depending on the sun's position. The changes of mood that punctuate the story are actually central to its structure, for in the middle of this comic melodrama, an interior flashback gives us the tragic tale of Edouard's rise to fame and the suicide of his wife. Life itself is shown to be full of impossible shifts in fortune and feeling. It is all one big joke. By the film's end Truffaut succeeds in bringing poignancy to the most trite of love stories through the incongruous juxtapositions of his style. Fame, obscurity, suicide, love, murder, robbery, and a whole family saga are woven together in 85 minutes under the routine theme song Charlie plays in the bar. Life is seen to be bigger than any of its events, bigger than the bitter end to which it leads all of us. Truffaut doesn't believe in his tale, but he does believe in the emotions it brings up and in the powers of cinema to evoke those emotions. In mixing genres and moods and in vigorously exploring powers of elliptical editing, fluid cinemascope, and lyrical music, Shoot the Piano Player exalts such power and remains a delight to watch. Beyond parody, its sincerity is the love Truffaut feels for the movies. That sincerity is infectious.